VICTORIA, B.C. ─ For a full decade, B.C. forests have been releasing dramatically more carbon into the atmosphere than they have absorbed out of the atmosphere. B.C.’s forests emitted 256 million tonnes of carbon dioxide during the period 2003 – 2012. In contrast, B.C.’s forests absorbed 441 million tonnes of carbon dioxide from 1993 to 2002.This is the key finding of a Sierra Club BC analysis of B.C. government forest carbon emissions data. Including forest emissions in B.C.’s officially reported emissions results in a massive shift in overall provincial emissions from 188 million tonnes for 1993 to 2002, to 894 million tonnes of carbon dioxide for 2003 to 2012. Net emissions from provincial forests are the result of logging (after accounting for carbon stored in wood products), wild fires, slash-burning and the reduced carbon sequestration capacity of B.C.’s forests due to the Mountain Pine Beetle outbreak. The 2003-2012 emissions from B.C. forests are equivalent to four times the official annual greenhouse gas emissions of the province, primarily from burning fossil fuels (63 million tonnes in 2013).Despite their magnitude, forest emissions are not counted as part of the official greenhouse gas emissions of the province. While B.C.’s forest carbon loss has been made worse by the Mountain Pine Beetle outbreak and a number of serious wildfire years, the biggest factor remains poor forest management. In particular, destructive logging practices like clear-cutting, especially of old-growth rainforest, and slash-burning are huge contributors to the carbon emissions from B.C. forests. Sierra Club BC is calling on the B.C. government to make forest health a priority, instead of LNG exports. Sierra Club BC is calling on the B.C. 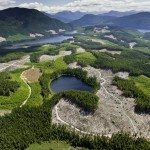 government to phase out subsidies to fossil fuels($1 billion in 2012/13 and 2013/14)and instead make $1 billion available to develop and implement a 5-year forest action plan to restore the health of B.C.’s forests in order to absorb carbon from the atmosphere and support long-term forest jobs. Core elements of the plan should be restoring government capacity for forest stewardship, increasing forest conservation, improving forest management, adjusting the annual cut to a sustainable level and creating more jobs per cubic metre. Shifting fossil fuel subsidies to forestry should be a key strategy in B.C.’s climate action plan 2.0.